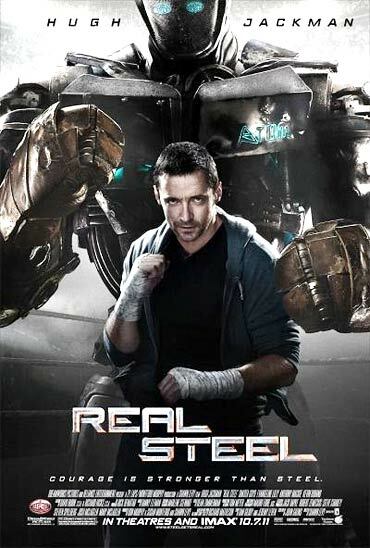 Australian hunk and X-Men star Hugh Jackman stars in Shawn Levy's Sci-fi film Real Steel, that's released today in India. The actor, who won us all over with his charm on his recent visit to India, talks about his new film, his experience with former boxing champion Sugar Ray Leonard and how his kids react to his onscreen image, in an e-mail interview with Sonil Dedhia. 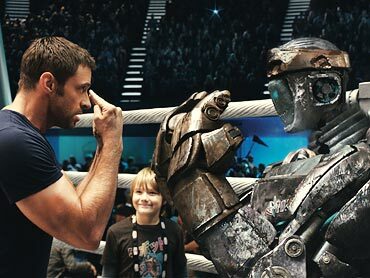 What was it about the Real Steel script that appealed to you? There were many reasons behind doing this film. First of all, it was Steven Spielberg. He sent me the script and I loved my character of Charlie, he is someone who has decided to take a view that the world is unfair to him; that in so many corners he's so disappointed in himself, such a low opinion of himself. He feels that he's failed at everything and now he's trying to eke out a living in this thing that he hates. Also when Shawn Levy came on board, it strengthened the film even more. Director Shawn Levy is known for making good comedy films. How was the experience of working with him in an action movie? It was phenomenal. He's a rare breed. There are very few people like him who are as good at what they do and who are as nice as he is. He has pulled off the action so well in the film that you need to see it to believe it. Can you talk about your experience of shooting with robots as they were created not only by using CGI, but animatronics too? The whole experience was amazing. The robots used in the film are all real so there was no talking to the air pretending that you're talking to a robot. 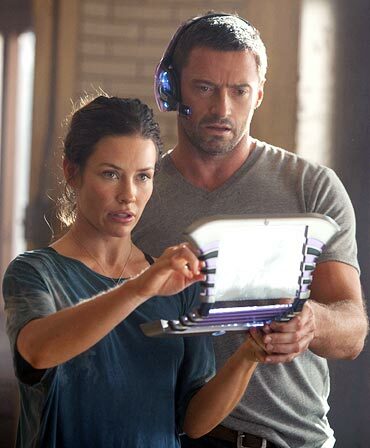 We all were interacting with real robots throughout the film. It was an extraordinary experience. Boxer Sugar Ray Leonard came onboard and taught you how to box. What was the experience like? It was interesting. The first day we were working together, they had a film crew filming behind-the-scenes footage. He's a world champion, so he was just sparring with me pretending to punch my stomach... which kind of hurt! Because the camera was there, he just wanted to play around. He's such a great guy; we've hung out quite a lot, and I really like him. He really talked to me, which surprised me, about the corner man. My character in the film is the corner man. He's not the boxer. I own and control these robots and promote them, so I'm the guy in the corner. Sugar Ray really got very intent with me. He said that he didn't think I realised how important the corner man is in boxing. And, even though there are robots in there, what you need to convey is that you're the rock; you're the strength. Sugar Ray said he used to hire Angelo Dundee for the last two or three weeks leading up to a fight, precisely because Angelo knew exactly how to talk to him during a fight. He said if you get a corner man who doesn't know how to talk to you, there's nothing worse. I need to know when to pick my fighter up, when to shut up, when to say the right thing. And it's in the training; how you get mentally prepared. The connection between the fighter and that corner man cannot be broken at any point. And it's something I hadn't really focused on. So it was terrific. He was also very open about the cost of boxing, the personal cost, not just the physical cost. The pursuit of that goal, that excellence, to become champion of the world, is difficult. Things get sacrificed on the way for the attainment of that goal. And he says six weeks out from a fight, it's like you go do your own thing. And you have to push everything and everyone out. And that can be hurtful to people. You are 42, is it difficult to stay in shape? Physically did you take special care like to take care of yourself for this role? Hey, I am just 42 ;) Well yeah; I had to do a lot of home work for the role of Charlie in terms of physical fitness. As I said earlier, I had to train myself under Sugar Ray Leonard. How do your kids react when they see your movies? They like my movies especially X-Men but they don't think that their daddy is cool. I just did a tour. I was doing this one-man show and I was in Toronto. On Sunday, both the kids came when I sang a song for my wife, I pulled her up and my son's face said it all. I like to dance, but, you know, I'm Wolverine and what I did then wasn't cool. And later I was dancing and being a bit of a goof ball, so he turned to his mom and said, "My dad is so embarrassing." Most of the things I do are embarrassing to him! You recently came to India and said you'd like to act in Bollywood films. Any plans to do it? Which was the last Hind film that you saw? Would you like to be remembered as Wolverine? Yes, Wolverine is a special character but I would like my audience to remember me as each and every character that I have portrayed till now or will portray in future.